In these early days of the emergence of the Social Web, we’re never surprised when the services we use do not work together. Fragmentation and frustration rule the day, and 15 years into the consumer Internet revolution, we are still doing lots of things manually that will *someday* happen “magically” in the cloud. First, the context. 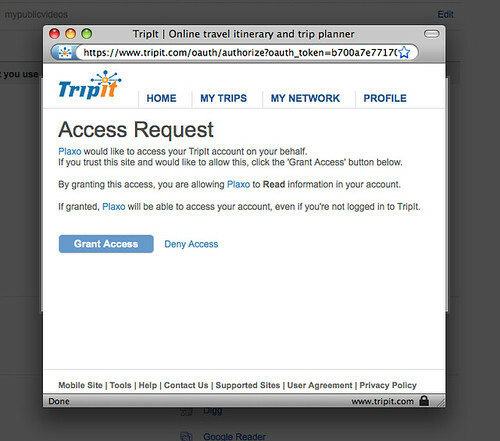 Plaxo [disclosure/reminder: my employer] rolled out a new release today that included a first-class integration with TripIt, a travel itinerary service that I had heard good things about from my colleague Joseph Smarr, but never actually signed up for. 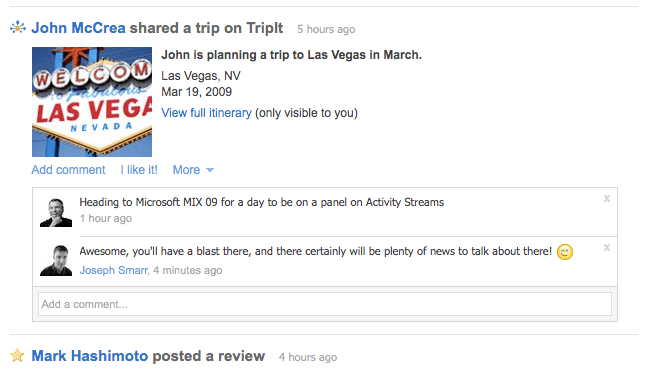 Well, it was also the day before our flight down to Austin for SXSW and a week before my flight to Las Vegas for Microsoft’s MIX 09 to speak on a panel about Activity Streams. So, it was unavoidable that I should check out TripIt and set up an Activity Stream from it into Plaxo. First, I went to Outlook, where I had an email from Carson Wagonlit, our company’s official travel agency. 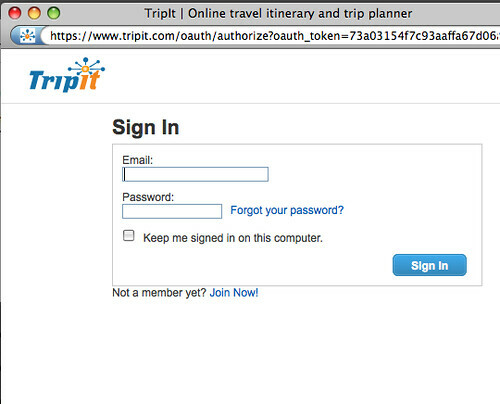 I clicked on the link to view my itinerary, and was surprised to see an “Add to TripIt” link. A lightbox popped, prompting me to email the itinerary, which was as simple as typing in my email address. Yep. 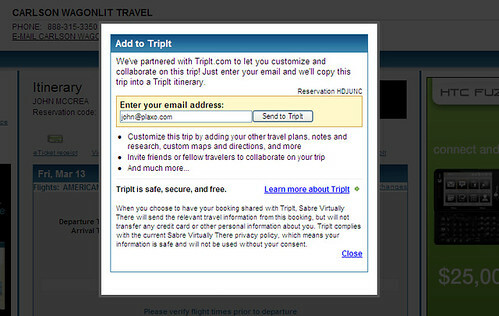 No heavyweight registration step, just kicking off my relationship with TripIt wid the act of emailing a single itinerary! Sweet. I was instructed to check my inbox for an email from TripIt, and moments later it arrived. It included a link to my itinerary on TripIt, which I clicked on. 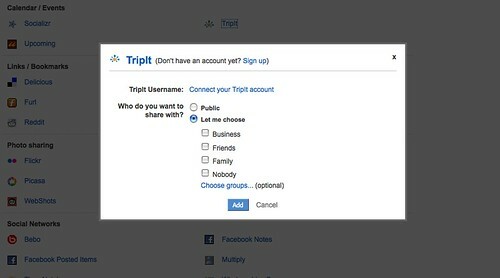 After filling in just a couple pieces of info and choosing a password, I was a full-fledged TripIt member, all set up and ready to go. There are so many things about this that are way cool. First, the event looks great, because it includes more details than most third-party feeds into Social Web aggregators. Second, this is a private feed, shared with only the subset of my connections that I choose to share it with. Third, they can (and did) comment on it, sparking interesting conversations. Fourth, they can get the info about my travel plans, though not in a level of detail that I would be uncomfortable with. And fifith, I see a link that is only visible to me, which connects to the full itinerary details over at TripIt. Pretty sweet, huh? But that’s not all. When I go to my Plaxo calendar, I see my trip to Austin for SXSW and my trip to Vegas for MIX 09 are there, automatically injected as a result of connecting my private Activity Stream to Plaxo. This is a *great* example of data portability with the user in control, and a glimpse into the world of the Social Web we all want to bring about. If you’re heading to SXSW, give it a whirl!